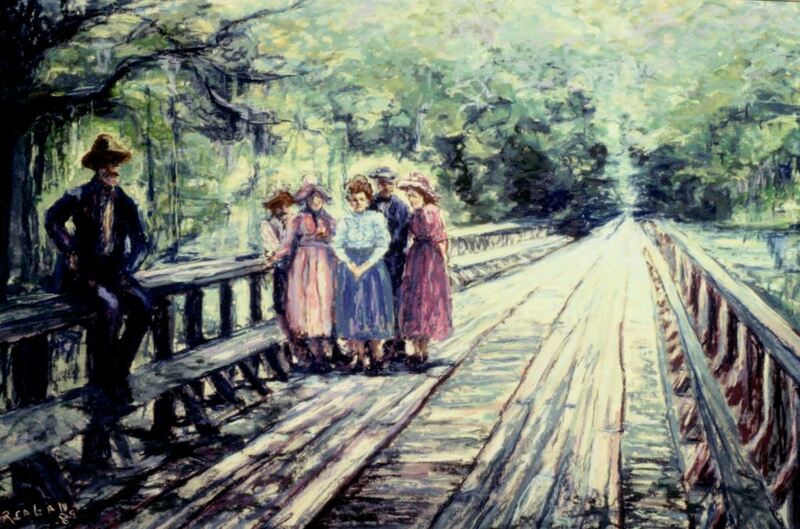 A painting by Bettye Reagan, a local artist in Central Florida, inspired by a photograph of the first bridge built across the Wekiva River. The Wekiva River, sometimes spelled Wekiwa, in a river originating in Apopka and joining the St. Johns River. The Florida Department of Environmental Protection (FDEP) has designated Wekiva as a Florida State Canoe Trail, an Outstanding Florida Water body, and an Aquatic Preserve. The wood used to build the bridge in the photograph was milled in Markham, a community west of Sanford and north of Heathrow, Florida. Original painting: Reagan, Bettye. Wekiva River Bridge. 2001: Private Collection of Bettye Reagan. Digital reproduction of original painting: Reagan, Bettye. Wekiva River Bridge. 2001. "Wood Used For 1st Wekiva River Bridge." RICHES of Central Florida. https://richesmi.cah.ucf.edu/omeka2/items/show/6949. "Wekiva River." St. Johns River Water Management District. http://www.floridaswater.com/middlestjohnsriver/wekivariver.html. Reagan, Bettye Jean Aulin. 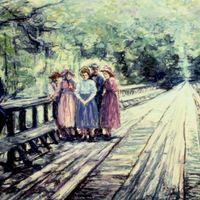 “Wekiva River Bridge by Bettye Reagan.” RICHES of Central Florida accessed April 19, 2019, https://richesmi.cah.ucf.edu/omeka/items/show/6950.